With so many comments that keeping cleaner wrasses is usually deemed to be highly unsuccessful, I felt I should advise of my successes in the hope that it isn't just blind luck. When I first started this hobby in Jan 94 I had no interest in keeping the common cleaner wrasse that was sold around here. Later, an article in a magazine got me interested just because of the possibility of them really able to clean parasites off fish I do keep. A hobbyist helping me learn my way around the hobby told me that most, but not all, will die in aquariums. I took an interest in them at that time although the apparent futility of keeping them kept me from buying them. Having no computer at the time, I had to rely on word of mouth as my primary source of information. I started watching them in the LFS tanks whenever they had some in, and noticed that while most didn't eat anything when fed by the staff of the stores, some would pick at the tiniest pieces of what ever was being fed, usually frozen brine shrimp. Fortified by the knowledge that at least some would eat, I purchased one for my tanks, and, initially fed grated frozen brine shrimp to it. Some time later, I screwed up while preparing my home made frozen food mixture for my other fish, (actually it was mainly for my butterflys) and ground up the beef heart too much. I added it to the mixture anyway as I didn't want to waste it. After a few days of feeding this to my tanks, I happen to notice the cleaner wrasse was gobbling up the smaller pieces of the mixture which I believed to be the beef heart. The next time I made my food mixture up, I made the beef heart the usual size but put some back in the blender to make it smaller like the "accident" I had last time. 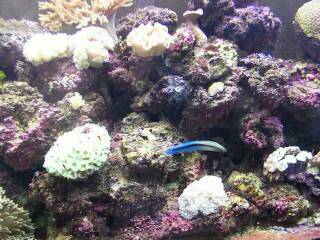 On feeding just this "finer" ground beef heart to the tank, the cleaner wrasse appeared to be in his glory now. In time, however, the cleaner began eating larger pieces and also eating all the other foods of the home made mixture. Based on this experience, I purchased a second wrasse for the butterfly tank and used the beef heart to get the wrasse to grow and to wean it onto other foods as well. I lost both of these fish about a year later, one in my reef just disappeared and I never found the remains, but the other in the butterfly tank was part of the complete tank crash when I went on holidays and the caretaker couldn't solve a tank problem that developed. I replaced them both and was successful in growing them larger as well. By chance, a customer picking up a coral frag I sold him, saw the cleaners and made me an offer I couldn't refuse for one of them. Since then I've sold 3 more at the one to two year stage, and have seven in my tanks at the moment. I did lose one a while back, but it died the day after I purchased it, but the two I purchased with it still are with me as are all of the last three that I purchased. I had a sale for the oldest one in my reef tank, but I couldn't get it out so it's still there. Please let me know if any of this information is of any help to you as I certainly would like to know if it really works or is it blind luck so far on my part.